I apologize for the unexpected absence from the blog! Now that Marcus and I are mostly settled into our new place, blogging shall commence at normal pace once again! Anyways, I paid a long-awaited visit to The Dutch last month with Alice, and Clare, her friend from college who also enjoys good food. I received the recommendation from my co-worker, James, who raved about everything on its menu, as well as via the relatively recent restaurant review by Sam Sifton in the Times. Chef Andrew Carmellini, The Dutch's executive chef, began his culinary career at the young age of fourteen in his Ohio hometown at an Italian joint, later moving onto a fine-dining establishment that centered around French cuisine . He went on to study and train at the Culinary Institute of America, where he cooked for New York state's governor, Mario Cuomo, on the weekends. Post graduation, Chef Carmellini worked the line at San Domenico in New York City, then traveled to Italy where learned the arts of making pasta, prosciutto, wine, cheese and truffle hunting. He returned later to Manhattan to work at Lespinasse and Le Cirque, spending a year cooking and traveling through France and England in between. Later on, Chef Carmellini helped open Café Boulud in 1998 as chef de cuisine (earning him 2 James Beard Awards) as well a A Voce near Madison Square Park (where he earned his first Michelin star) in 2004. Five years later, he opened Locanda Verde, the restaurant housed in Robert DeNiro's Greenwich Hotel in Tribeca followed by The Dutch in the last year. I waited in the bar area as I waited for Alice and Clare to arrive for our evening dinner reservation. I liked the style and look of the bar -- the look of the organic wood, low and industrial-style lighting. 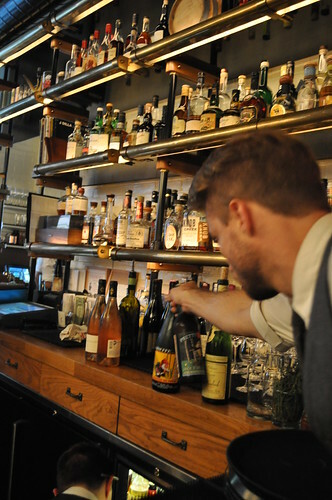 The old-school attire of the bartenders were a nice touch too -- sweater vests are always a plus in my book! 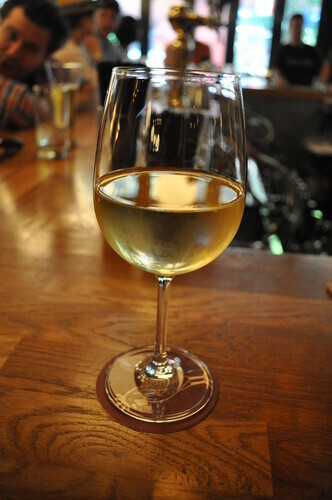 I decided to have glass of white wine recommended by the bartender, given my inclination for fruitier wines. This one was a glass of Furmint Sec from Tokaji, Hungary produced by Királyudvar with a 2007 vintage. This is Királyudvar's signature (and innovative) dry white wine balances viscous intensity and bright acidity of the furmint grape (i.e., the grape that is indigenous to Tokaji). Alice followed suit, too, once we were seated. Inside The Dutch's rear dining room. 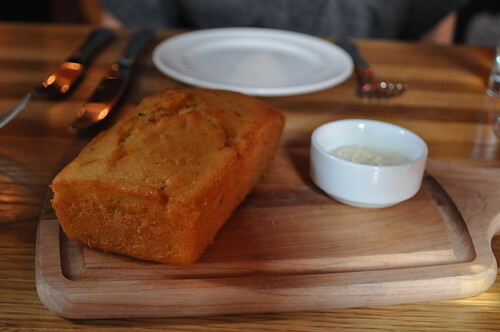 As we began perusing the menu, we were given a plate of freshly baked cornbread and some salted butter. Although the texture of the cornbread was incredibly crumbly (making it kind of difficult to eat), the savory flavors were good overall. 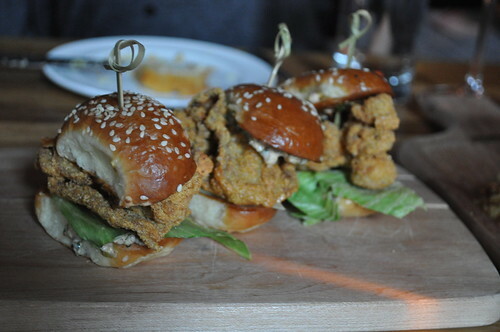 Clare suggested we start with these Little Oyster sandwiches (from the "snacks" section of the menu), and I'm so glad we did! They were lightly battered and fried, making them super delectable. The tartare sauce wasn't very heavy complementing the bivalve's texture and naturally fishy (the good kind) flavor. Highly recommend these for table starters! 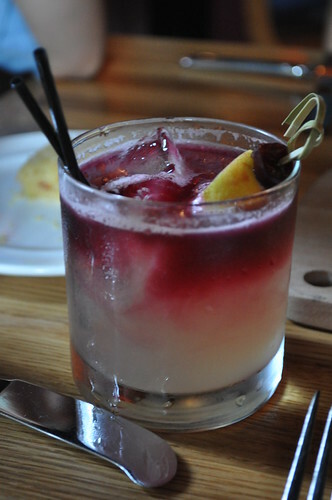 New York Sour with mellow corn whiskey, lemon, peach bitters, and a claret float (i.e., the red wine from Bordeaux or wine of a similar character made elsewhere that floats in the cocktail, similar to the grenadine in a tequila sunrise). It was very strong from the whiskey (though when isn't whiskey strong? ), but a very solid cocktail from a flavor standpoint. 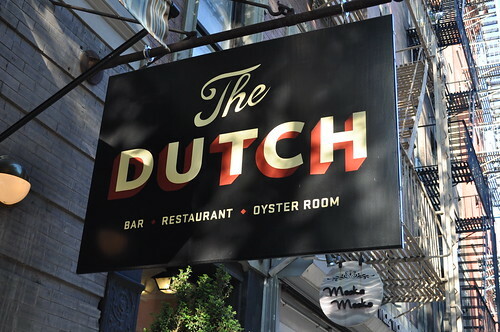 The Dutch's menu referred to its evening menu as the "supper" menu, a quirky yet fun touch, as "supper" specifically denotes a light or informal evening meal (typically, a late-night dinner). I found the word choice here to be both clever and fitting. Plus, the "main courses" on this menu are also called "seconds" -- as if they're the second helpings to the appetizers (i.e., first courses) you probably ordered. For my main course, I ordered the black cod with smoked mushrooms and yuzu-chili broth. I'm a sucker for black cod when I come across them as menu items at restaurants. It certainly lived up to everything I thought it would be. The texture was warm and silky at the ideal temperature, foaming with the Asian flavors from the yuzu's citrus as well as the spices from the chili infused in the broth. 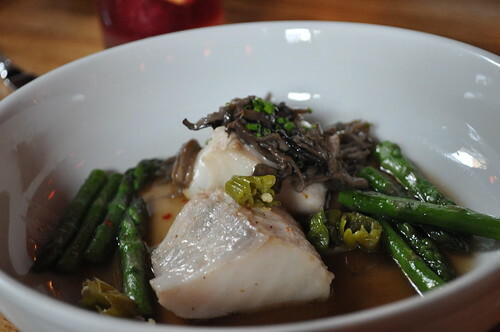 The earthiness of the smoked mushrooms and asparagus complemented the light but flavorful broth and the savory cod in a very synergistic way. Overall. it was a very light, clean, and refreshing main course. Alice went with the sea scallops with peas, bacon, and chipotle pepper. The scallops were seared with a tender center (no raw sliminess here!) and toasty surfaced, topped with crisp bacon, a sea of peas, and sautéed shallots. 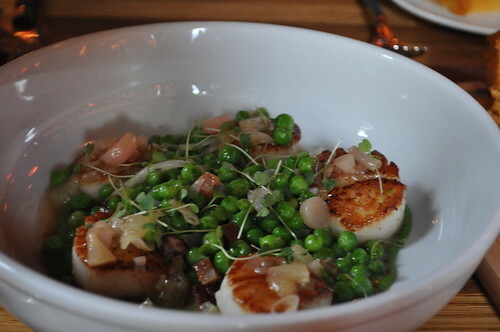 The dish here gave the otherwise"fancier" gourmet main ingredient of sea scallops a more homestyle feel from the familiarity from the medley of peas, shallots, and bacon. A lovely main course, for sure. 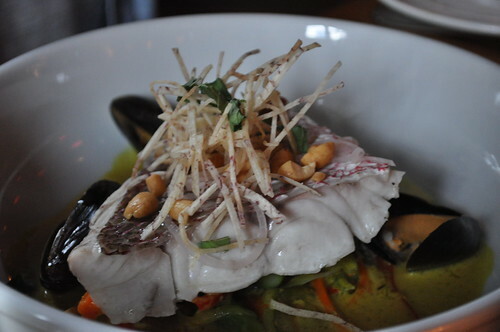 Clare had the steamed black bass with mussel-lemongrass curry and peanuts, which was ultimately a curry seafood stew. I liked the fun addition of shredded taro chips (along with the peanuts), which added a nice textural contrast to the smooth soupy base and soft black bass. I normally am not a big fan of curry, but The Dutch executed it very well here -- very flavorful without being extremely overwhelming in spices where it clouds the other ingredients and their unique flavors in a said curry dish. The sea bass here (as with the black cod) was steamed to the perfect temperature where the center was cooked just enough before becoming overcooked. The mussels were a delicious addition as well. 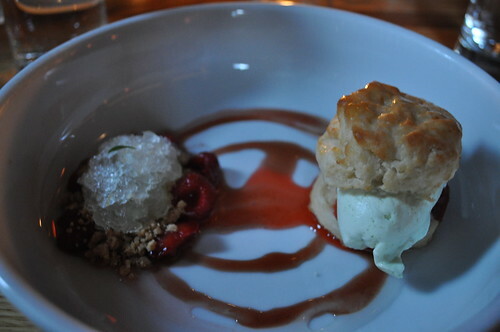 For dessert, I had the strawberry shortcake with honey butter biscuit, tarragon cream, and lemon-anisette granita. It wasn't the strawberry shortcake I had expected (i.e., the traditional sort), but I thought the deconstructed ingredients presented as dessert was quite creative. Never did I expect a butter biscuit to be incorporated into a strawberry shortcake dessert, but it seemed to work as the "shortcake" part of the dessert. With tarragon cream scoop at its center and citrus-infused granita atop a fresh medley of berries, this dessert was light and very refreshing -- just a little too tart for my personal liking. 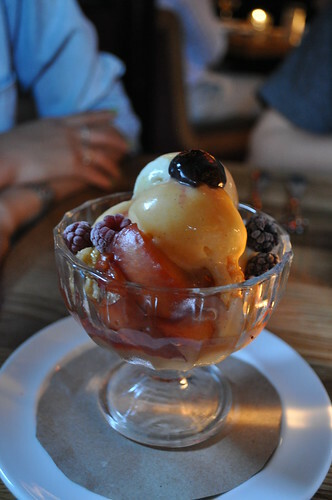 Clare had the summer sundae with apricot sorbet, frozen custard, and sautéed stone fruits, caramel, and raspberries. I found the use of sautéed stone fruits to be interesting, but overall, we found this dessert to be just okay -- it was good, but nothing really stood out much. 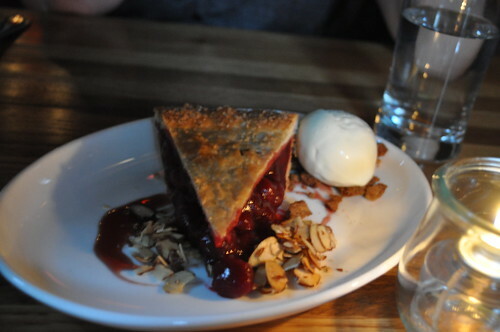 Alice had the pie of the day which was a cherry pie served with toasted almonds a la mode. Being the pie fanatic she is, Alice found the pie to be mediocre as well. Nevertheless, it was prepared well -- just didn't have the punch we were expecting. Findings: Overall, the three of us had a very lovely dinner at The Dutch. The snack we ordered, along with each of our main courses, proved that Chef Carmellini carefully crafted a menu of some solid dishes that essentially created a poetic symphony of flavors, spices, and ingredients for the restaurants patrons to enjoy and on which to pass the good word. I'm excited to see what new items Chef Carmellini will have in store for The Dutch during the fall season. I really liked that the courses we had were proportionately sized (i.e., not at all sparse, yet not anywhere close to overly generous diner portions). Tastes are well-balanced and used to close to their highest potential which was quite admirable. It is every so often that I come across a restaurant that is worthy of this kind of praise, and The Dutch is one of those restaurants. 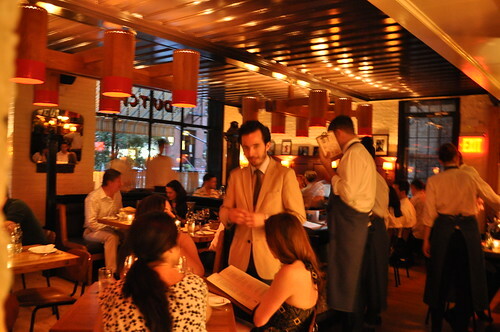 Looking forward to more visits in the near future -- it certainly is the "jack-of-all-trades" in the restaurant world, as it is great for dates, catching up with friends, impressing out-of-towners, and relaxing over a lovely Sunday night supper in a pleasant corner of SoHo. Price point: $5 for each miniature sandwich, $13 for each glass of white wine, $14 for each cocktail, $26-29 for each second, $10 for each dessert.